UPDATE: Weekend Detours for Pedestrian Bridge Installation Saturday, July 29 at 10 p.m. through Sunday, July 30 at 6 a.m.
Saturday, July 29 at 10 p.m. through Sunday, July 30 at 6 a.m.
On or about Saturday, July 29 at 10 p.m. through Sunday, July 30 at 6 a.m., detours will occur on the Dulles Toll Road, Dulles Greenway, and Sunrise Valley Drive. 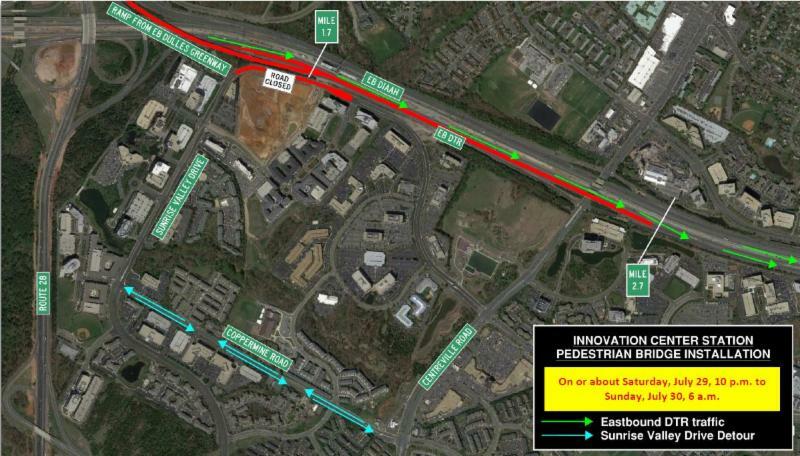 The detours will allow Dulles Corridor Metrorail Project crews to set a pedestrian bridge that will provide access over the eastbound Dulles Toll Road to the Silver Line's Innovation Center Metrorail Station, and to continue work on the aerial guideway over the Dulles Greenway. See details below and on the next page. Information about additional detours will be forthcoming as the work progresses. All work is weather dependent and subject to change. The eastbound Dulles Greenway at mile marker 11.0 near the Old Ox Road overpass will be detoured to eastbound Old Ox Road (Route 606). Traffic to Dulles International Airport, the DIAAH and the eastbound DTR will follow eastbound Old Ox Road to southbound Route 28 (see Figure 1). The eastbound DTR will be diverted to the eastbound DIAAH near mile marker 1.7 Eastbound DTR traffic will return to the toll road lanes near mile marker 2.7 (see Figure 2, next page). Sunrise Valley Drive will be closed between Dulles Station Boulevard and 600 feet north of Sayward Boulevard. Through traffic will be detoured to Coppermine Road (see Figure 2). All businesses and residences will remain accessible. Figure 2: Detours will occur on the eastbound DTR and Sunrise Valley Drive. Drivers are asked to use caution and pay attention to all signage and barricades. Large, slow-moving vehicles may be exiting and entering the highway and local roads at various times. Information about additional detours will be forthcoming as the work progresses through July and in the upcoming months.